Apollo 11 moonwalker Buzz Aldrin made a special appearance "on Mars" as part of a new exhibit at the Kennedy Space Center in Florida. We all love Buzz Aldrin for his commitment to do anything to promote space exploration. The second man on the moon did the "moonwalk" for Dancing With the Stars back in 2010. He's authored multiple books, with the spry 86-year-old focusing on Mars in two recent missives (Mission to Mars and Welcome to Mars). And now he's walked on Mars. Virtually, of course. Aldrin is a part of a new exhibit at NASA's Kennedy Space Center called, appropriately enough, "Destination: Mars." As a holograph, NASA felt he would help bring the barren landscape alive as he described his red-tinged surroundings. And it's finally a chance for the public to get a glimpse of the new virtual reality software the agency is using to explore the Red Planet. 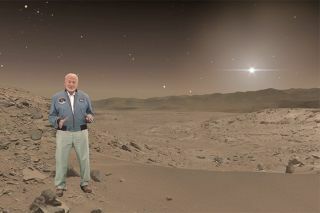 "Buzz Aldrin has made it a focus of his life in recent years to promote exploration in general and specifically to Mars," said Jeff Norris, mission operations innovation lead at NASA's Jet Propulsion Laboratory in California, in an interview with Discovery News. "We, on the other hand, were addressing a challenge (with the exhibit), which is Mars is awfully empty and we wanted there to be a guide to this experience," he added. "People felt they should have a person who could explain to them and capture some of the facts of the environment, the emotions of this experience of exploring Mars." Curiosity driver Erisa Hines stands next to the rover as a holograph in the "Destination: Mars" exhibit. The exhibit is a demonstration of OnSight, a platform NASA is starting to use to direct the Curiosity rover. A small group of test engineers wearing Microsoft HoloLens headsets have periodic "meetings" on Mars, standing in the same location where Curiosity is. The early feedback is that it is easier to see where Curiosity should go next, Norris said. "We are learning what we need to learn so we can scale the number of scientists who are using OnSight and support the rover in the months ahead, and for the next mission, the Mars 2020 mission," Norris said. There is another, older rover on Mars called Opportunity, but there are no plans yet to include it in the program although it could technically be done, he added. The early tests included confirming the device can communicate with the ground (including Skype calls), tracking its position inside the space station, and drawing holographic annotations. There is no firm date yet for moving it to operational status, but the HoloLens are on station for when the time comes. ANALYSIS: Virtual Reality Nature Walks for Astronauts? HoloLens was also tested in the Aquarius underwater laboratory last year as a part of project NEEMO, where astronauts spend a couple of weeks underwater perfecting techniques for different kinds of space exploration (such as the ISS or even going on an asteroid.) It served as a great first test for the HoloLens because there are technicians in the habitat who are experts in operating Aquarius, Norris said. So the astronauts could be given procedures in maintaining the habitat, with the added "safety net" of an expert right there should the procedures not help the problem. A less-publicized use of the HoloLens is for an application called ProtoSpace, which is used for visualization of spacecraft designs. Some of the missions it is being used for include the Mars 2020 rover mission and the future Europa orbiter that is expected to head out to Jupiter's moon in a couple of decades.